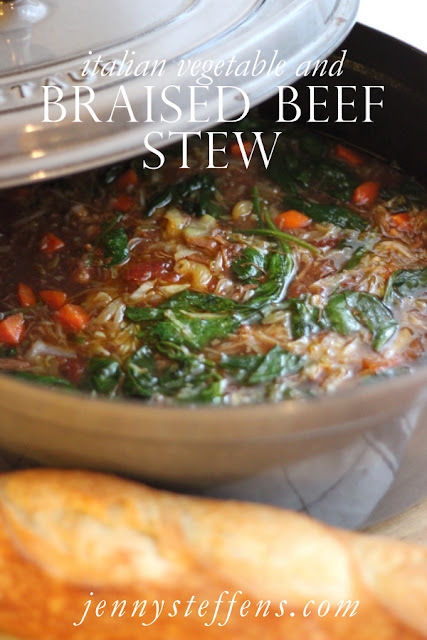 If you haven't noticed, I've been really into stews and soups this year. I love that I can make them early in the day and they'll be ready at dinner time after simmering all day. They make the house smell great and they make us feel good on a chilly night. In a large dutch oven, cook bacon, rendering fat. Add beef and sear stew meat and onions on high heat, for 2-3 minutes. Add garlic and cook for 30 more seconds. Add red wine, broth, tomatoes and bay leaves. Remove from heat, cover and put it into the oven. Slow cook in the oven at 250 degrees for at least 4, but up to 6-8 hours. Remove the stew from the oven when the meat is tender and shredding. Remove the bay leaves. Add carrots, spinach, cabbage and pasta to the pot and cook on the stove top for 20 minutes until the vegetables and pasta are tender. Serve with garlic french bread. Slice the bread, drizzle with olive oil and place it on a sheet pan. Put under the broiler for 1-2 minutes until toasted. Rub with a garlic clove. The stew sounds wonderful. Does the parmesan cheese go on the bread? Thanks. Also wondering if this would work in the crockpot. Jenny - this looks delicious. Just wondering if you can adapt for a crockpot? I work all day, so I'm not home to leave the oven on or with with a dutch oven pan. Thanks! I would start in a skillet and fry the bacon pieces, then sear the meat, onions and garlic. Then I would deglaze the pan with the wine, then dump it all in the crockpot to let it go all day. I hope this helps - let me know how it goes! Oh, and I when you get home, turn it one high and add the noodles, carrots, spinach and cabbage. Let it cook for 20-30 then serve. Love love love soups/stews with extra veggies!! I just made myself a bowl...delicious!! Can't wait for the kids to try it!! Looks so yummy --how many does this serve? WOW! This is really an amazing and attractive post about a wonderful recipe of Italian stew. I appreciate your posted wonderful photos. Thanks for sharing such an interesting post.